If you smile into the mirror and are self-conscious about your not-so-pearly-whites, you're probably wondering how to whiten teeth fast. Because, honestly, when you barely have the energy to remove your makeup at the end of the day, time is of the essence. "The main culprits of yellow teeth are aging, smoking and dark foods or drinks such as coffee, red wine, black tea, colas, dark sauces and even various fruits like blueberries," says Dr. Kevin Sands, a celebrity cosmetic dentist who works with everyone from the Kardashians to Emma Stone. "These items are high in pigment-producing substances that stick to tooth enamel." Don't worry, we're not asking you to give up your morning coffee or evening glass of wine in pursuit of whiter teeth. Because the stains that come from these pigmented foods and drinks are on the outer layer of your teeth, they can be removed, explains celebrity cosmetic dentist Dr. Desiree Yazdan MS, DDS. Here, we've rounded up all the easy ways you can whiten teeth at home -- from quick teeth-whitening kits to natural teeth whitening ideas. So what are you waiting for? 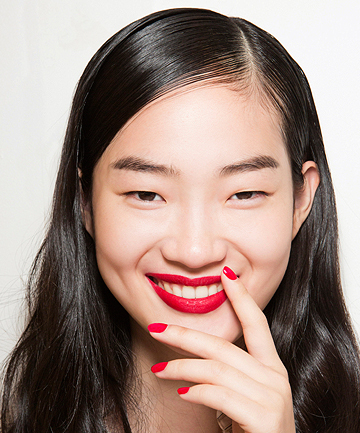 Your megawatt smile is waiting, and it only takes minutes to get whiter teeth. rinse with 50/50 peroxide and water, eat a raw apple, brush with baking soda, oil pull (swill) with coconut oil, popcorn, and believe it or not, brush with the contents of an activated charcoal capsule, and brush off. It will take a few times, and look like "very bad" teeth for a few minutes lol but will be whiter when you're done. I knew about eating cheese, but I had no idea about eating strawberries. I love Super Smile. Using Vaseline takes me back to my days of being a majorette, when we would apply to our teeth so that we could smile continually. I also love "Dentisse," a tooth polish with the chief ingredient of clay. It is unique but works well to deep-clean. The information is nice but it was not what I was expecting. i don't know about putting vaseline on my teeth, will they feel yucky afterwards or do you taste it? has anyone tried this yet on total beauty? Vodka and bronzer?!? This was very interesting!